I’ve decided to call myself “The Queen of Leftovers”. The pan grilled chicken from last Sunday, went into a Chicken fried rice with raw mango and basil on Monday. It tasted better than the grilled chicken dish itself. The best part about leftovers is that you can turn into a great rice dish or an omlette, or maybe something more. 1. Heat oil, tip in the onions and ginger garlic paste, and let them change colour. 2. Add the chicken, raw mango and basil leaves and saute for a minute or two. 3. Add cooked rice and mix well. 4. Add fish sauce, oyster sauce and mix well. 5. Take off heat and serve. The fish sauce and oyster sauce are optional. You could go with soy or any other sauce as well. If you have other vegetables like beans, carrots, peppers, mushrooms – toss them in too. I didn’t know if I should have cooked these whole chicken legs Indian or random way. Of course, I went the random way. All I wanted was a nicely charred chicken with a sweet and sour sauce. Marinate chicken in above ingredients for a few hours or even better, overnight. 1. Heat the sesame oil and place the chicken legs for them to get a nice char. 2. Flip them over after 7 – 8 mins and cook for another 7 – 8 mins or till done. 3. Remove and place over paper towels. 1. After removing the cooked chicken, in the same pan, tip in the leftover marinade with half a cup of water and let it come to a boil. 2. Add the bouillon cube, fish sauce and green chilli sauce along with the basil. 3. Simmer for 3 – 4 mins and take off heat. 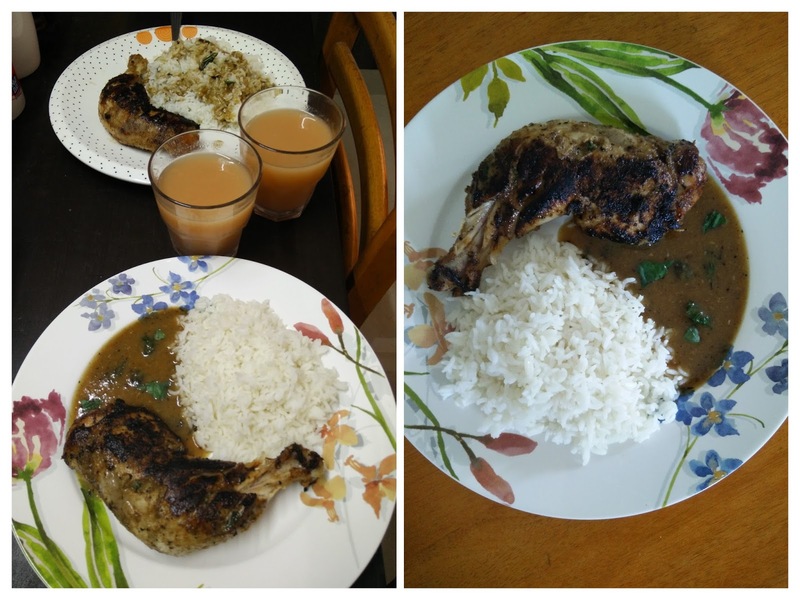 Serve the chicken and the sauce with a side of vegetables or plain cooked rice like the way I did. All I wanted was a good pan grilled chicken breast for dinner. The rest just came into picture (quite literally) when I thought of sides for my chicken. Instead of the usual steam veggies, I thought of watermelon and green apples. Thankfully, the shop that is almost never well stocked had the fruits I needed. Also, a pretty plate food never hurt anybody. 1. Cut the chicken breasts horizontally (just so it cooks fast) and marinate in orange juice, lemon juice, ginger garlic paste and salt for at least 30 mins. 2. In the meanwhile prep your fruits by cutting them into cubes. 3. Grease a nonstick pan with olive oil. 4. Once the pan is hot, place the chicken and cook till each side is nicely charred and cooked through. Around 4 mins each side (but please check yourself thoroughly). 5. Take it off the pan and keep aside. 6. Pass the rest of the marinate through a sieve or a tea strainer. 7. Heat the marinade in the same pan the chicken was cooked in for 4 – 5 mins. 8. Take it off the heat and keep aside. 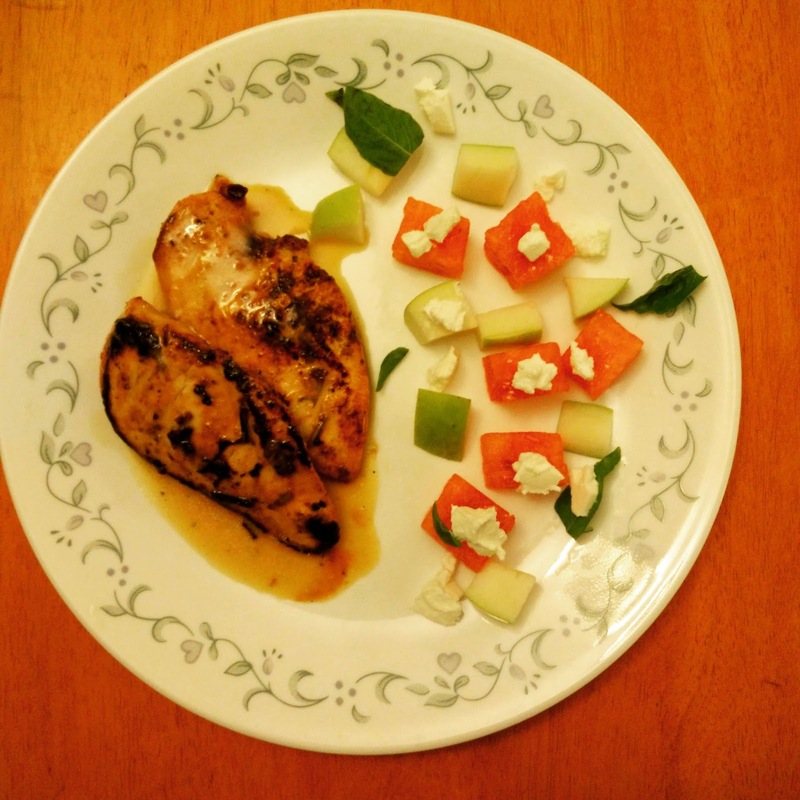 Plate your dish – Chicken on one side of the plate and fruits on the other side. Crumble the feta over the fruits and pour the warm sauce made from the marinade all over the chicken. Toss a few basil leaves for freshness if you’d like. I wonder if it’s Karma or just my luck – every time I order chicken from the local store, I get it really late, or cut up in pieces instead of the whole boneless breast, or like this time around, cooked. I never get mad at them for doing this. I’m only amused and work with it. 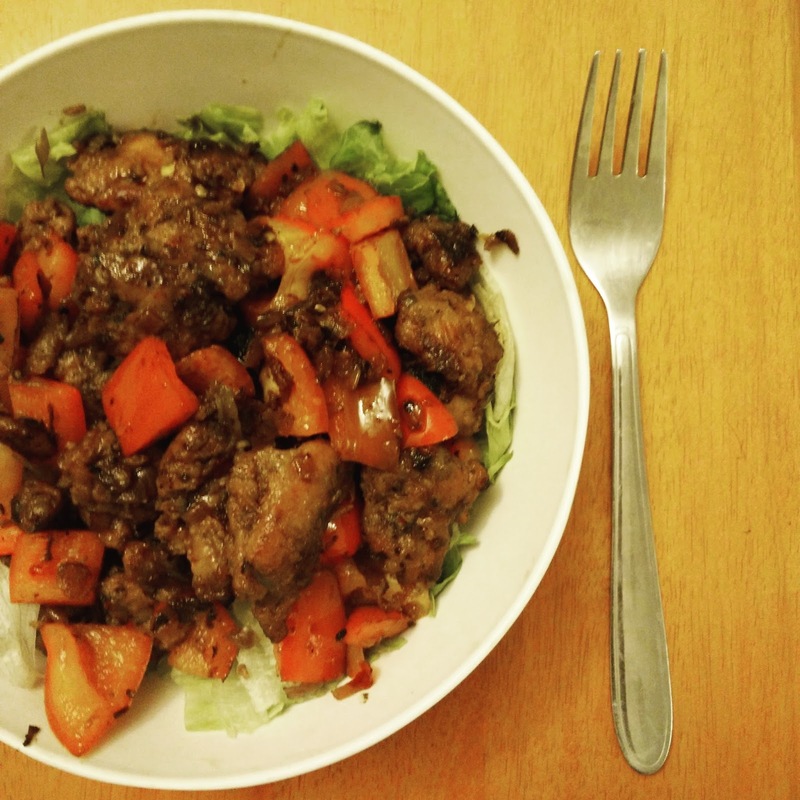 Pieces of Pepper chicken, or any leftover cooked chicken you may have in the fridge. 1. Saute the chicken and bell pepper till the pepper is slightly cooked/charred. 2. Take off heat and lay the mix on a bed of lettuce. 3. Mix the ingredients for the dressing well and pour it all over the salad. 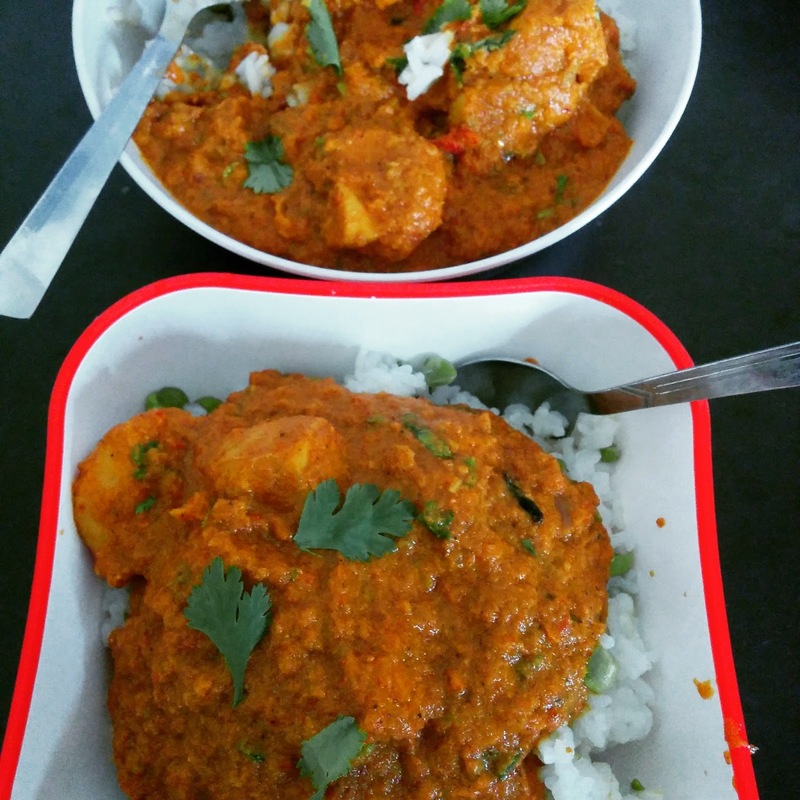 I have gained a reputation for making the spiciest curries in the history of mankind. I couldn’t think of having people over again before I fixed that. Hence, Stew. Also, it’s one of my grandma’s best dishes. She made the best mutton stew. 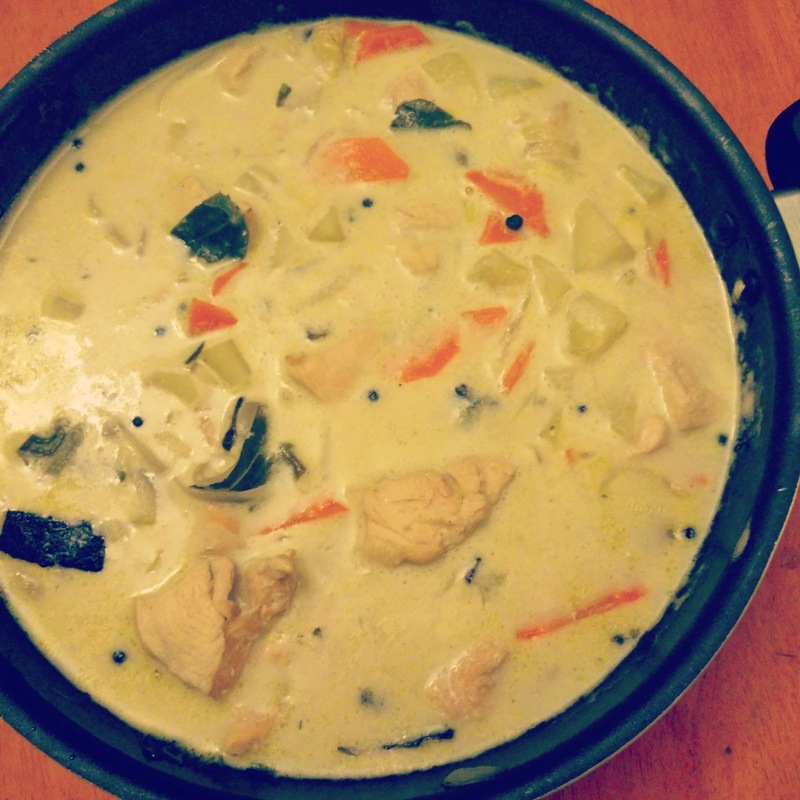 Going back to fixing my reputation – no chillies of any kind were adding in the making of this Chicken Stew. 1. In hot oil add the whole spices – cinnamon, cardamom, pepper, cloves and saute till fragrant. 2. Add sliced onions and saute till they turn soft. 3. Add chicken, potatoes and the stock along with salt. Add 1/2 of water. 4. Cook for 8 – 10 minutes and then add the carrots. 5. Cook for another 6 – 7 minutes. 6. Add coconut milk and simmer for 2 – 3 mins. Finally. 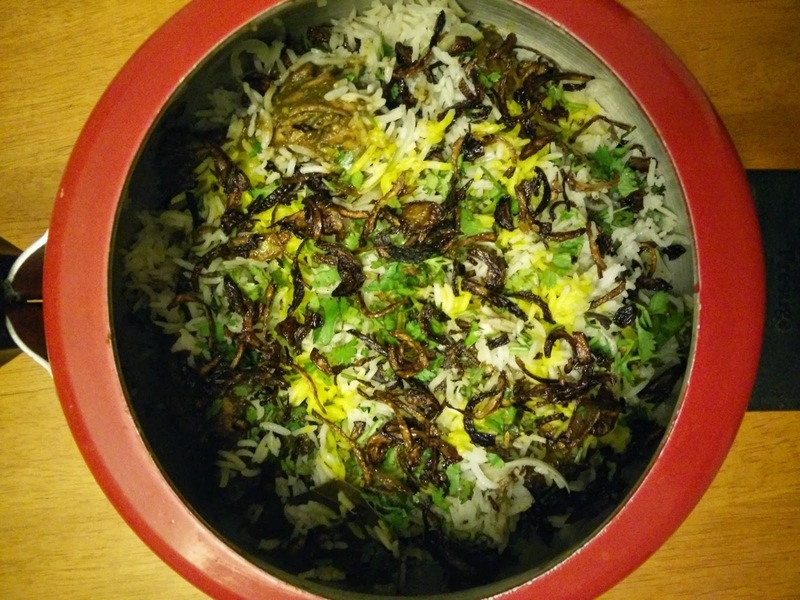 Without my mother hovering over my shoulders, I made biryani. It’s her recipe anyway. 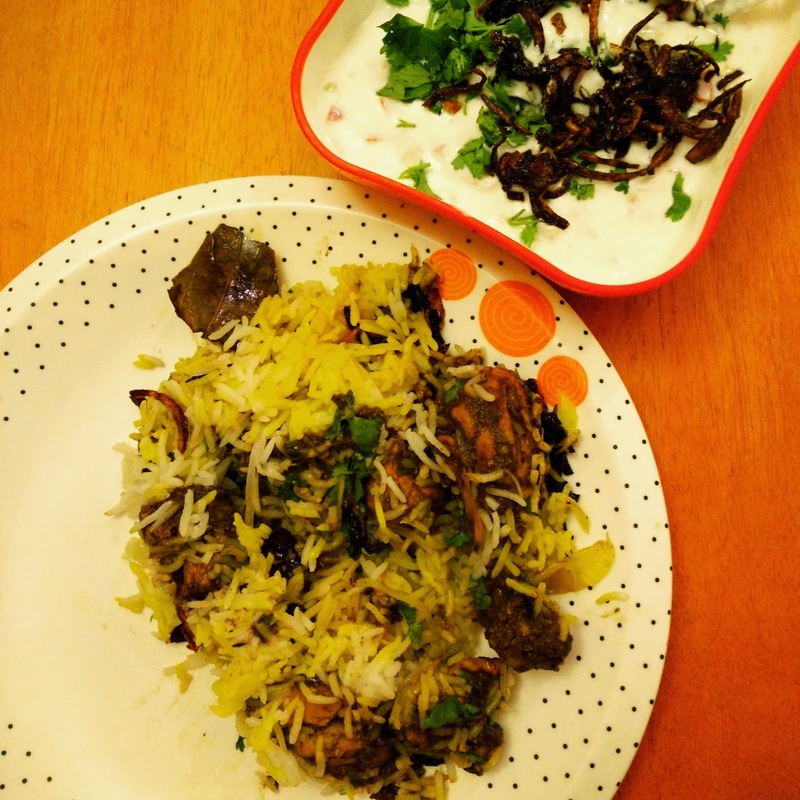 Relatively easy, this biryani has two elements to it – rice and chicken masala. Both are to be cooked separately and layered with fresh coriander leaves and fried onions. Next stop, Mutton Biryani! 1. Saute all the ingredients for the masala in 1 tsp ghee. 2. Grind in blender to make a paste, adding some water. 3. Add salt to taste and cook chicken in the masala for 20 mins in med-low flame or till chicken is tender. 1. Rinse the rice with water at least 3-4 times and soak it in water for 10-15 mins. Drain water and let the rice dry for 10 mins. 2. Saute onions in 2 tbsp ghee/oil along with bay leaves. 3. Tip the rice in and add 4 cups water. 4. Add salt and bring to a boil. 5. Now let it simmer with a lid on in low heat for 18-20 mins. 6. Take it off the heat and let it rest with the lid off. In a large deep dish, layer the biryani – first with rice, followed by sprinkling of coloured water, then the chicken masala, then coriander leaves. Repeat. 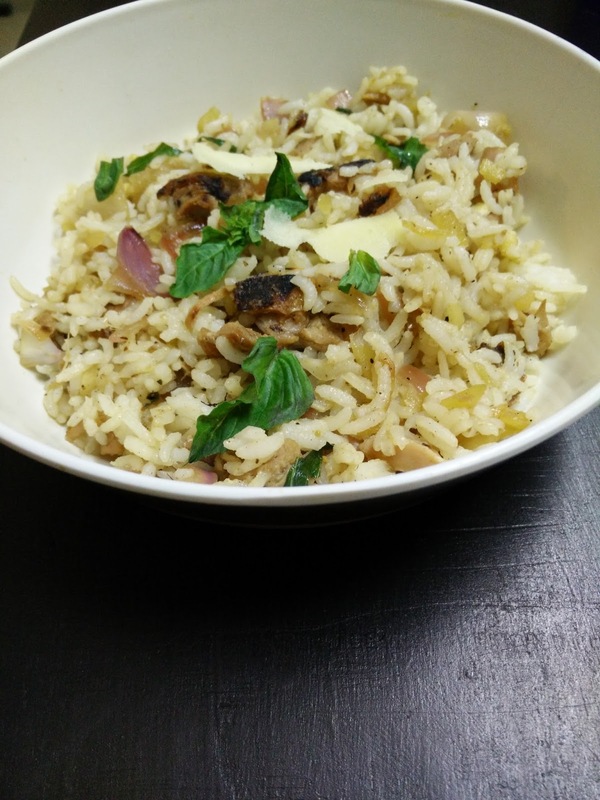 Top it with fried onions and more coriander leaves. I’ve never been a fan of using readymade masala/powders to make curries. But I was curious to see how it would work if I used it as a marinade. 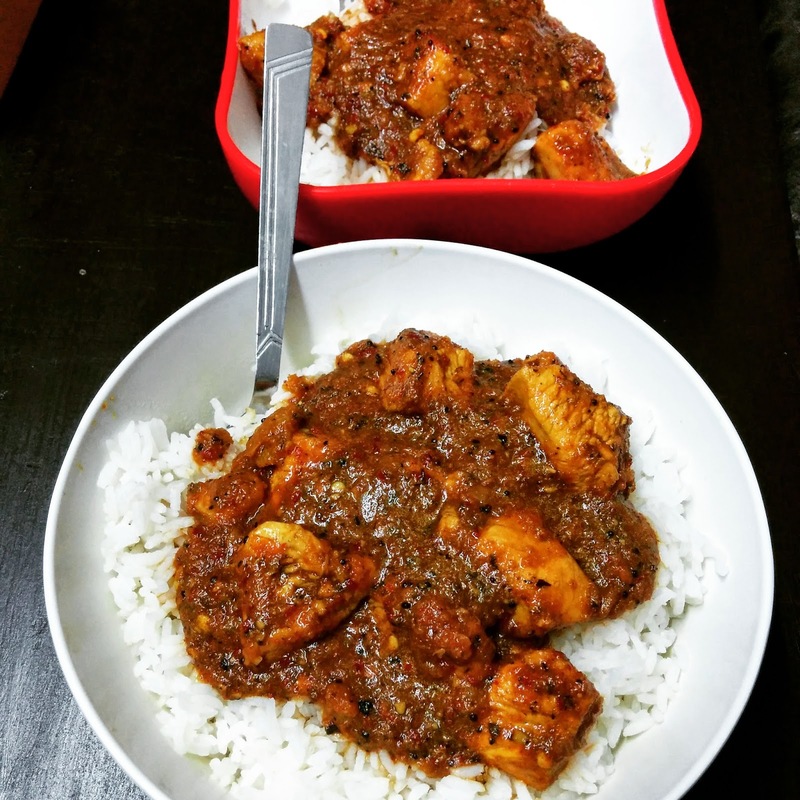 I tried the Shaan Chicken Tikka Masala powder to marinate my chicken before making a curry out of it. 1. Marinade chicken in mentioned ingredients for 2 hours. 2. Heat oil and add cumin seeds and chillies. 3. Add onion paste along with ginger garlic paste. 4. Once onion changes colour, add turmeric and chilli powder. 5. Add tomatoes and let it cook for 10 mins. 6. Add salt and tip the chicken along with the marinade. 7. Cook for 15-20 mins in low flame with half a cup of water. Ghee Roast is originally from Kundapur. God knows the Kundapur women are fiercely protective of their recipes. I found my way around it, but it doesn’t come close to the one I tasted a few years ago. A Kundapur friend’s Kundapur mother’s, whose recipe she never shares. 1. Saute all the ingredients for the ground masala in ghee one by one. 2. Grind into paste with some water. 3. Heat more ghee, add curry leaves and then tip in the ground masala in it. 4. Cook it till the colour of the masala darkens. 5. Add the chicken and a cup of water, cook for 20 mins in med – low flame or till chicken is cooked. Serve with dosa or rice. 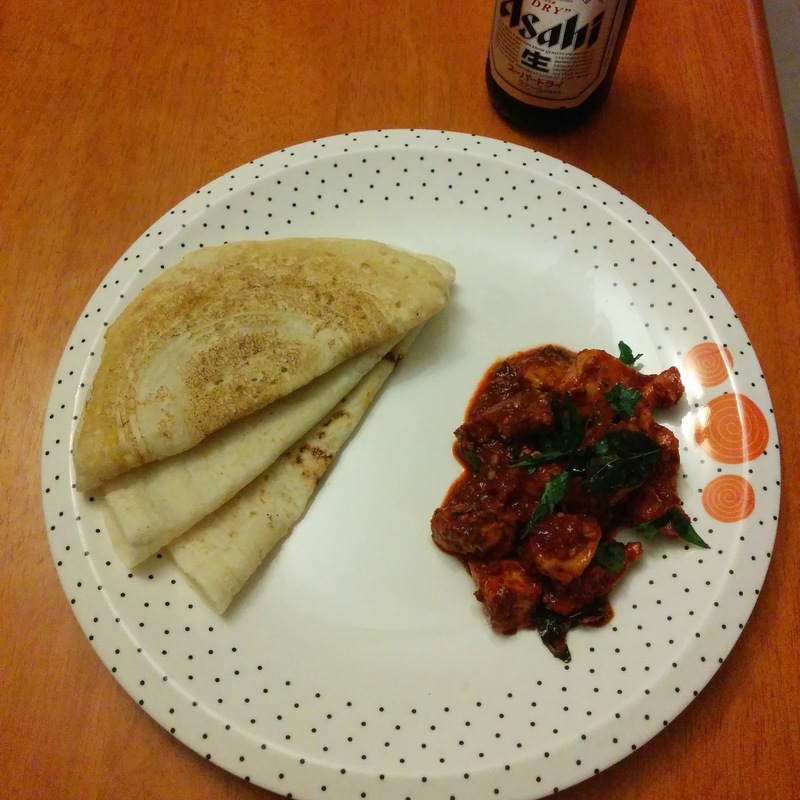 In an ideal world, this should have been Pork Vindaloo. But I’m not in an ideal world, I’m in Gurgaon. This is the recipe I found online and worked my way around it. Brown sugar – 2 tbsp and Vinegar – 4 tbsp to be mixed and kept aside for 15 mins. 1. Heat oil in a pan and mustard seeds to let it pop. 2. Add turmeric powder, coriander powder and salt. 3. Add the chicken and let it brown for 5-6 mins. 4. Remove chicken and add the onion paste to the pan. 5. Cook it till the paste changes colour. 6. Add the ground paste and cook it out. 7. Add chicken and cook it for another 6-7 mins with some water. 8. Add the brown sugar and vinegar mix and simmer for a couple of mins. I’m yet to explore the length and breadth of Tamil cuisine. But Chettinad, is still love. Unlike the usual onion-tomato based curries, this one is onion-pepper based. Its spiciness comes from green chillies and whole pepper. The fragrance of curry leaves when it splutters in hot oil is the perfect start to cooking this dish. 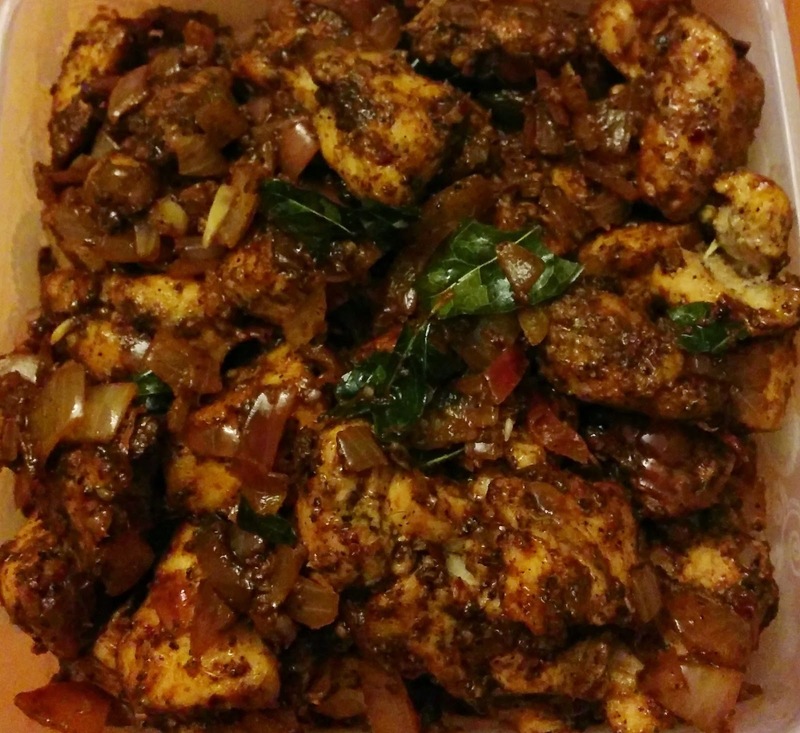 I tried my hand at something that would come close to Chettinad style chicken. 1. Dry roast all the ingredients for spice mix and grind it to a powder. Keep aside. 2. Heat oil in a pan, add mustard seeds and let them pop. 3. Add curry leaves and let them splutter. 4. Now add onions and saute with the green chillies and garlic. 5. Add the spice mix and salt and saute for another 2 mins. 6. Add chicken, mix well and let it cook for 10 mins. 7. Add lemon juice and take off flame. Best when served with plain dosa.